Marquis® (15% w/w ponazuril) Antiprotozoal Oral Paste is supplied in ready-to-use syringes containing 127 grams of paste. Each gram of paste contains 150 mg of ponazuril (15% w/w). Marquis (ponazuril) is designed to be delivered as an orally administered paste. 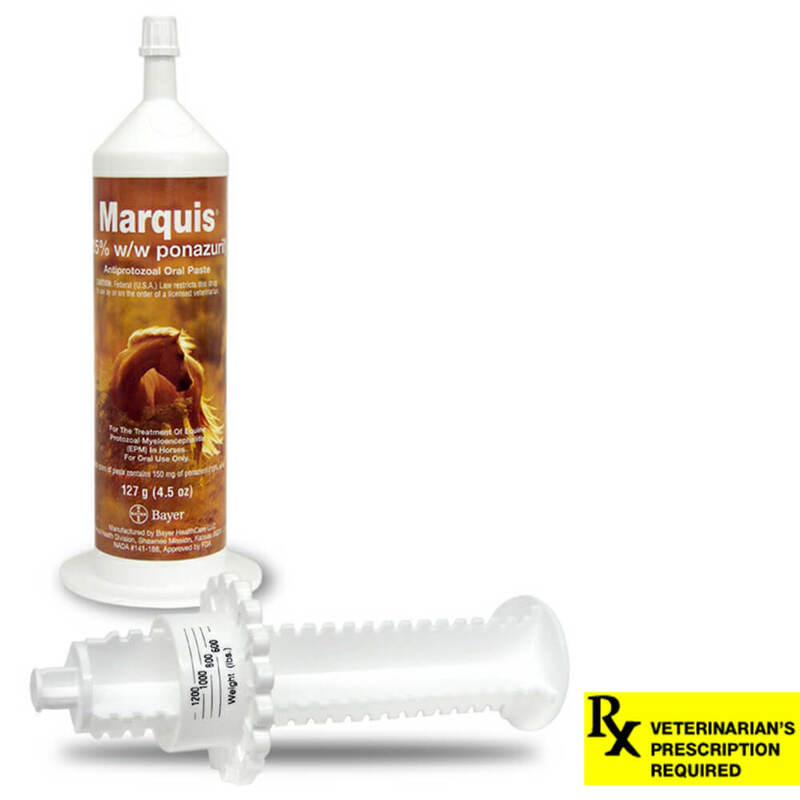 Each syringe barrel of Marquis (ponazuril) contains enough paste to treat one (1) 1,200 lb (544 kg) horse for seven (7) days, at a dose rate of 5 mg/kg (2.27 mg/lb) body weight. The plunger contains a dosage ring calibrated for a dose rate of 5 mg/kg (2.27 mg/lb) body weight and marked for horse weight from 600 to 1,200 lbs (272 to 544 kg). The syringe barrels are packaged in units of four with four reusable plungers. This package provides sufficient paste to treat one 1,200 lb (544 kg) horse for 28 days at a dose rate of 5 mg/kg (2.27 mg/lb) body weight.Marquis (ponazuril) is indicated for the treatment of equine protozoal myeloencephalitis (EPM) caused by Sarcocystis neurona.